There has been quiet some noise floating around the SEO realm in the past few days. For one, Cyrus Shepard‘s latest Moz post revealed a heavy correlation between a page’s number of Google +1s and high search engine rankings. As a result, many SEOs have started to believe that +1s directly impact higher search engine rankings when this actually isn’t the case. To combat many SEOs’ wild assumptions, Matt Cutts has directly come forth to reveal that Google +1s do not have any impact on a page’s ability to rank. In other words, Google does not use +1s as a search engine ranking signal. So what does this mean and what should businesses do? Even though Google +1s do not directly result in higher search rankings, we can still strategically leverage the platform to achieve high rankings. Below I’ve listed 4 key concepts we can immediately start work on to achieve our ranking goals. While Cutts has revealed the number of +1s make no difference to high search engine rankings, the link equity passed through each live Google+ link does. Each time your content is shared through a Google+ page, link equity directly flows back to your website. This directly contributes to an increase of PageRank and page authority for the receiving page. Your plan A will consist of creating engaging content in order to attract sharability on the Google+. Ask your friends and family to share your latest article on their Google+ profiles. If they don’t have an account, encourage them to register and create a Google+ profile. For maximum effectiveness, ensure the use of the hash tag command on relevant industry keywords to increase content outreach. Now that you’re consistently writing and posting new content ready to be shared, it’s time you really get integrated with Google+. For any industry professional, Google+ is a great way to engage with other professionals in the field and it certainly makes Google’s job a hell of a lot easier when trying to determine your position within the industry. Frequent engagement and social activity with other professionals in the field affirm your position as a fellow industry leader. Most importantly, this will also help attract quality links back to your own profile to increase your profile page’s PR. Begin by sharing content, actively posting, following industry experts, family and friends and consider writing reviews for local businesses to build up profile authority. Similar to engaging on Facebook and building Twitter followers, your Google+ profile will slowly begin to build itself and before you know it will result in a snowball effect. Two very important things to keep in mind; perseverance and always remember to provide value when engaging users and sharing content. There are free dofollow links up for grabs on every Google+ about profile page. Make sure to fill out the Introduction field under the Story section. For SEO purposes I’d also recommend to link out via an anchor text to the URL of your preference for an extra relevant backlink. After you’ve completed the above section, scroll down and locate the links section. The links section will allow you to link out to various other profiles. This may include your website’s Facebook page, Twitter, Linkedin, Youtube, Google+ Local and any other profile you may consider relevant. 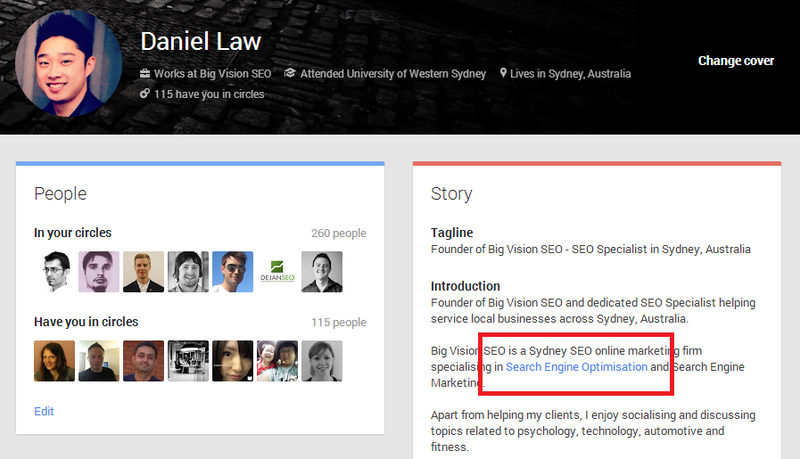 I recommend you check out this article for a more detailed and in-depth look at Google+ optimisation. This now brings up us to the Contributor To section and more importantly, Google Authorship. 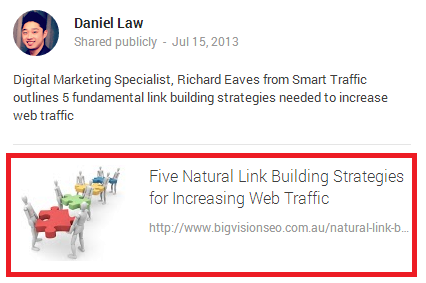 By utilising Google Authorship you are essentially claiming all your work online. This is vitally important from an SEO perspective as it’ll allow Google to effectively tie up all your content across the web to one single profile – your Google+ profile. Many search professionals have speculated that Google might introduce authorship as a ranking signal called Author Rank in the near future. However, at this stage it is all merely speculation and assumptions. My opinion? I think Google Authorship is destined to play a massive role in determining rankings in the very near future. Get a head start while you still can. I’m not going to dig to deep into Google authorship implementation but the guys over at Webfor have done a pretty neat job with their thorough Google Authorship implementation tutorial. For users using WordPress and the Yoast SEO plugin, you can also implement authorship very easily, simply follow Yoast’s short guide and you’ll have it down in no time. Best of luck with utilising Google+ and feel free to post any results we’ve seen as a result of using the network.